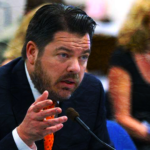 Michael Roberson, the Republican Minority Leader in the Nevada Senate, in the past has championed a strict voter ID bill, that was only stopped in the chamber because of legislative Democrats. After Roberson lost control of the Nevada Senate in 2016, he led the Nevada GOP efforts to recall three women Senators. The two Democrats and one nonpartisan state senators were being recalled without cause, and the recall efforts were used as a Republican power play to redraw legislative district lines after the 2020 elections, and try to retake the chamber. Michael Roberson is running for Lieutenant Governor in 2018.